Our Guides provide an overview of a particular market segment, including market size, technology trends, and expected developments. We analyze all announced products in that segment, compare key technical features, performance, and architecture then highlight strengths and weaknesses. Clients find our guides particularly useful when selecting a vendor or partner. We also provide tutorial material for those who are less familiar with the technical terminology or standards. 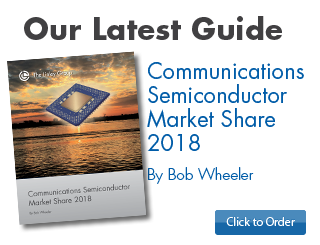 Provides market share data for more than 20 categories of communications semiconductors, including Ethernet products, broadband interface chips, embedded processors, server processors and FPGAs. Provides five-year revenue forecasts for more than a dozen categories of communications semiconductors including network processors, Ethernet components, PON and VDSL transceivers, network search engines, and optical-transport ICs. Forecasts market size and vendor share for application processors, cellular baseband, Wi-Fi combos, GPS, NFC, and other chips for mobile devices. 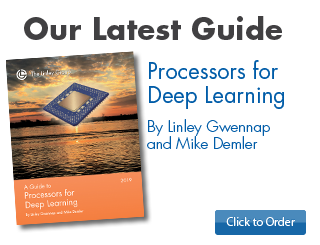 Covers processors and IP cores for accelerating deep learning, neural networks, and vision processing for AI training and inference in data centers, autonomous vehicles, and client devices. Covers 32- and 64-bit embedded processors with four or more CPU cores that are used for wires and wireless communications, storage, security, and other applications. Covers data-center switch chips for 10G, 25G, 40G, 50G, and 100G Ethernet. Also includes physical-layer (PHY) chips for 10GBase-T and 100G Ethernet. 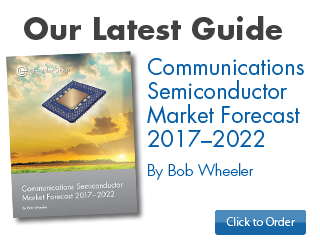 Covers processors and connectivity chips for IoT clients and wearable devices, focusing primarily on single-chip solutions with integrated radios. Covers 32- and 64-bit embedded processors with one to four CPU cores that are used for networking, automotive, consumer devices, industrial control, medical imaging, and more. Covers intellectual property (IP) cores that can be used in system-on-a-chip (SoC) and ASIC designs, including CPU, GPU, and NoC. 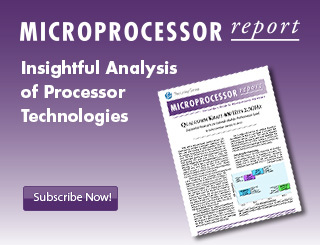 This new report covers wireless base-station processors that integrate CPUs and DSPs for Layer 1–3 processing on a single chip. Designed primarily for small cells, residential femto cells, and macro cells, these processors cut cost and power by replacing multiple chips. 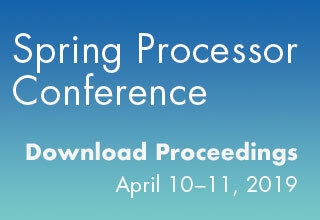 Covers packet processing for SDN and NFV, including high-end networking processors (NPUs) for switch/router designs as well as intelligent NICs (or smart NICs) for endpoints (servers). Covers processors for in-vehicle infotainment (IVI) systems, advanced driver assistance systems (ADAS), and autonomous driving as well as IP for vision processing and neural networks. Covers x86 server processors from AMD and Intel, emerging ARM-based server processors, and specialized accelerators and processors for high-performance computing (HPC). The guides are written in-house by our expert analysts. Technical accuracy is very high, as each vendor provides and reviews information about their products. We add our analysis and insight, comparing and contrasting the various offerings and indicating the applications for which they are best suited. To ensure that our opinions are objective and unbiased, The Linley Group does not accept retainers from the companies we cover. Our guides have been purchased by hundreds of companies, including network equipment makers, software vendors, chip makers, and investment firms.